Few gamers are completely unfamiliar with the Pokémon series, and many of us are old fans who have been waiting for its developer, Game Freak, to be dragged kicking and screaming into the modern era. Pokémon has always been a traditional series, evolving its system of battling and raising pocket monsters slowly and with subtlety while maintaining a rather dated look and feel. Finally, with the release of Pokémon X/Y on the 3DS, we have a series entry that looks and feels contemporary, from its graphical overhaul to its convenient multiplayer features. 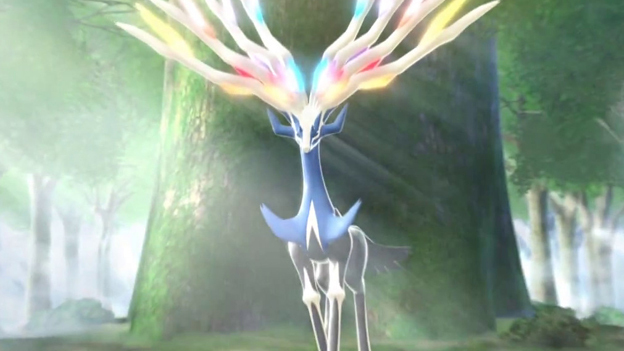 In fact, X/Y feels like a reboot that sets the stage for a new era of Pokémon games. The differences are apparent from the very beginning, in which the player is able to choose from three skin and hair colors during character creation. Then, the familiar ritual of taking the first steps out of the player character's hometown is transformed when the camera swings back behind that character, showing an impressive view of the tree-lined path ahead. Then, when entering the notorious tall grass in which wild Pokémon lurk, we're treated to a close-up view of that grass parting to reveal first a mysterious silhouette, then a close-up of the wild Pokémon in full 3D. It's glorious, and it gets even better when one realizes that the game is packed with an incredible variety of Pokémon to catch from the very first patch of grass onward. 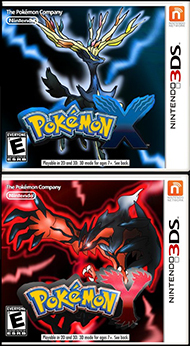 Set in the region of Kalos, which is inspired by France, X/Y is our first European-style Pokémon game. Its creators have not squandered the opportunity to show off the beauty of Europe's natural and historic scenery. There are quaint villages with cobblestone paths, museums, and palaces that look like they were built during Louis XIV's reign, and a Paris lookalike capital starring a Pokémon Gym that resembles the Eiffel Tower. There are even new French-inspired Pokémon resembling poodles, pastries, and perfumes--certainly a more complementary crowd than the gear and garbage-inspired Pokémon from the Unova region. Thanks to excellent use of the 3DS's graphical abilities and unusually strong area design, Kalos is actively fun to explore. In outdoor areas, players glide around on roller skates whenever they move using the circle pad, pulling off tricks and using grind rails to discover secret treasures. Skating is so much fun that I didn't even bother to use the bike once I received it. Even caves, once the most dreaded, dull places in these games, have been transformed into entertaining and puzzle-filled locations. The Mirror Cave, in which reflections on the walls reveal hidden stairs and cavern entrances, is a particularly strong example of this newly found design prowess. Any players nostalgic for the old days may feel free to visit the (completely optional) cave devoted entirely to the noble Zubat. Even better than exploring Kalos is experiencing the completely revamped battle-system graphics. Now fully 3D and featuring a dynamic camera, battles star cel-shaded Pokémon models that have been lovingly animated to emphasize each species' unique personality. Psyduck reaches up to hold its aching head whenever it's hit; Gulpin reveals a huge open maw when it attacks, and Mr. Mime constantly presses up against an invisible wall like its namesake. 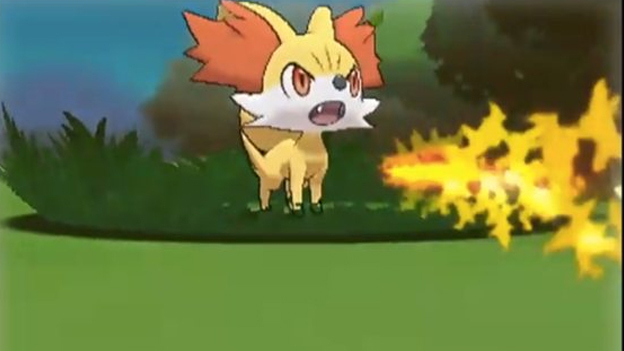 All the attack animations have been redone, and some, such as Flame Rush, look fabulous. They've even been mapped to specific locations on specific Pokémon, so Charizard actually breathes Flamethrower from its mouth, while Delphox casts it from a magic wand. The team that produced all these new animations is to be lauded, as the level of detail and care they put into every single one of the 700+ Pokémon species shows true dedication. It should be noted that there are reports of frame-rate issues in the world and in battle from some players. I only experienced a few mild slowdowns during my time with Pokémon X, but I was playing the digital version saved to a high-speed SD card on the original 3DS. I had a similarly good experience testing a digital version of Pokémon Y on a 3DS XL (same high-speed SD card brand). This experience may vary with the cartridge version or with slower SD cards. Kalos sounds almost as good as it looks. The soundtrack quality has wavered a bit in the last few games, but Pokémon X/Y brings the series back to form with catchy tunes that sound great even over the lousy 3DS speakers. The music and effects make good use of stereo sound, too. What's most welcome to Pokémon fans, though, is that the ancient sound effects that have been carried forward since 1996 have finally been updated. Older Pokémon finally have unique cries that don't sound like a 2400 baud modem being strangled, and the new attack sound effects spice up the battles nicely. There are even some nice touches, such as a unique Sing effect for the parrot Pokémon, Chatot. The world of Kalos is so full of wonder that it's a real shame Game Freak forgot to tie it all together with a coherent story. It's not that the game is low on text—there are plenty of characters around with a lot to say. It's just that the player's experience is a meandering adventure interrupted by occasional, weakly delivered goals such as “learn about Mega Evolution,” “visit a haunted house,” or “yeah, we should probably stop the bad guys from doing bad things, I guess.” Even the inevitable Pokémon gyms seem like an afterthought, as it's possible to completely miss some of them, only to have to go back and find them when the story stalls later on. The full experience of X/Y is such that the weakness in the story hardly matters, but it's a bit disappointing that all the other elements of the game have been improved, while the story was almost completely neglected. Next time, Game Freak should check in with the folks who write the Pokémon Ranger games, which at least manage logical narratives, crises that push the story forward, and memorable characters. Another area that hasn't received major underlying changes is Pokémon battles, but that's not a bad thing. The series' battle system has been slowly evolving over the years, and remains the best example of a turn-based, rock-paper-scissors elemental system in gaming. Easy to get into but with many hidden depths, it's Pokémon's battle system that keeps many adults hooked on the game, especially in multiplayer battles.